The Deer Creek Cabin at Beavers Bend Lodging in Broken Bow offers special touches throughout to make this wheelchair-friendly cabin accessible for everyone. Planning vacations that can accommodate the whole family just got a whole lot easier with this comprehensive guide of wheelchair accessible and ADA compliant lodging opportunities in Oklahoma. From cabins with concrete floors to bed & breakfast inns with chairlifts, this list will have you exploring the Sooner State in no time. If you’re looking for an inclusive and private getaway where you can reconnect with nature, then Greenleaf State Park in Braggs is a must. The specially-constructed Cabin on the Lake is only accessible by a private road that can be gated to ensure an uninterrupted stay. Upon arrival, you’ll find a paved parking area with a ramp that leads to a screened-in porch overlooking the lake. Head inside or follow the ramp down to your own private dock where you can fish, tie up a boat or just enjoy the view. The cabin is also attached to a wood deck with picnic table and grill. Special amenities inside the barrier-free cabin include a spacious layout with living area, kitchen, dining room and an oversized bedroom with queen-sized bed and twin-sized hospital bed. The restroom features a roll-in shower, shower seat with handheld shower head, grab bars in both the shower and toilet area, and a roll-under sink. Special touches like a ceiling track lift in the bedroom and bathroom, a commode chair and a trapeze ensure that guests have everything they need to make this lakeside getaway enjoyable for everyone. Because the Cabin on the Lake is in such high demand, reservations must be made well in advance. The cabin is available to rent by anyone regardless of mobility, but preference is given to guests with physical disabilities. Read more about the Cabin on the Lake and how to reserve it. Take in one of the state’s most beautiful places at Natural Falls State Park in West Siloam Springs near the Oklahoma/Arkansas border. The park’s crowning jewel is a 77-foot waterfall that plunges down into a clear, freshwater pool surrounded by liverworts and ferns. Although the base of the falls is difficult to reach for anyone with mobility issues, there is a parking lot at the top of the falls that is easily accessible. There is an overlook about 100 yards from the parking lot that looks down over the falls that is much easier to navigate. For something a bit more intensive, but still accessible, check out the Crazy Snake Trail at Lake Eufaula State Park in Checotah. At a quarter-mile long, this fully paved nature trail provides both shady secluded areas and open meadows dotted with wildflowers in the spring. Educational signs about the local plant and animal life are placed at a comfortable height for visitors in wheelchairs. Another wheelchair-friendly trail system is located at Mohawk Park in Tulsa. This 804-acre nature area offers nine miles of trails, most of which are wheelchair accessible. Head to the 0.3 mile Red Fox Trail for a shady retreat where you may be lucky enough to spot a honeybee hive. Also 0.3 miles long, the Blue Heron Trail will take you between the forest and the wetlands, and includes a bird blind overlooking Lake Sherry. Keep in mind that many of these trails are hard-packed dirt and may be difficult to traverse after a heavy rain. Book a stay at the luxurious Deer Creek Cabin at Beavers Bend Lodging to enjoy a gorgeous getaway complete with beautiful views and a trickling creek that flows behind the cabin. This one-story, two-bedroom escape features concrete floors throughout, as well as a zero-step entrance and a large wiper and scrapper entrance meant to clean your wheels before entering the cabin. Both bedrooms include low profile box springs, which allow easier access for wheelchair guests, as well as an oversized closet with lower hanger rod. In the private and accessible bathroom there is a large wheelchair shower, shower chair and slide-under sink. There are also lowered cabinet knobs and lowered light switches throughout. Enjoy a meal at the dining room table, which features a slide-out extension for easy access, or head outside to the grill. A concrete ramp leads from the front door to the fire ring/grill area, and the luxurious cabin also offers front, back and side-accessible covered decks. Enjoy complete solitude on this one-acre lot and bring along your pet for a small additional fee. Gather your large group at the Timber Rock Lodge. 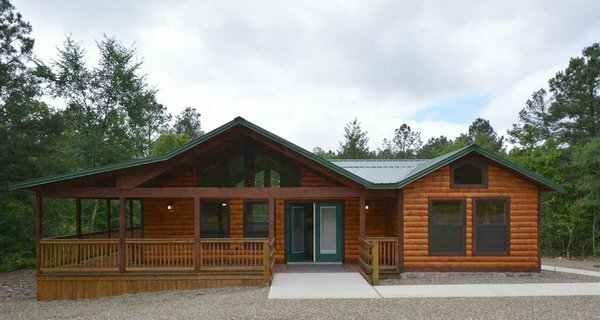 Offered by Broken Bow Lake Cabin Rentals, this spacious log cabin can sleep up to 12 people between four bedrooms and is ADA-friendly, featuring ramps and a wheelchair-accessible bathroom with roll-in shower and low counters. Wood and tile floors throughout and a spacious layout make this lodge easy to navigate. Play a board game in the great room or bask in the warmth of the outdoor fireplace on the large, covered deck. Play a board game in the great room or bask in the warmth of the outdoor fireplace on the large, covered deck. Another great option for larger groups is the Thunderbird Lodge from Lake Mountain Cabins in Hochatown. This unique space is actually two completely equipped cabins situated together as one. The lodge has three bedrooms, while the retreat has two bedrooms - all of which offer amazing views of the Mt. Fork River. A convenient ramp on the side allows access into the lodge, while the king master bedroom has a roll-up sink, shower with bench and comfortable height lavatory. The bedroom also connects to a deck overlooking the river. The Pebble Creek Cabin offered by Broken Bow Sundown Cabin Rentals is a two-bedroom cabin with loft that can sleep up to eight people. This pet-friendly cabin is wheelchair accessible with a ramp and includes a spacious layout with hardwood floors. At Robbers Cave State Park in Wilburton, Cabin 5 is fully accessible. Spend the day enjoying nature at the cabin area playground, lower area below the cave, nature center and trail to the outdoor classroom gazebo, all of which are accessible. Experience a romantic getaway fit for royalty at the Echo Canyon Spa Resort in Sulphur. Book a stay in the spacious Kathryn’s Suite and you’ll feel like you are in a medieval castle complete with two queen-sized, four-post beds and a vaulted ceiling. This accessible room also includes a private walk-in, sit-down shower. Guests will also enjoy plush robes, satellite TV and a private patio. Relax among beautifully-appointed furnishings within the Greek Isles Suite at the La Ville Inn in Davis. This downstairs room is ADA-compliant, while the Contempo Suite is also wheelchair and walker-friendly. Each suite features a king-sized bed, whirlpool tub, walk-in shower, cable TV and wireless internet. Treat yourself to a quiet and romantic stay at the Shiloh Morning Inn in Ardmore. This luxurious, bed-and-breakfast inn offers a wheelchair accessible room called Suite Memories. With a king-sized bed, corner fireplace, large soaking tub and separate shower, you’ll leave feeling completely refreshed. It also comes with a private patio and outdoor hot tub, and guests are treated to a decadent breakfast each morning. No trip to south-central Oklahoma, a.k.a. Chickasaw Country, would be complete without a visit to the Chickasaw Cultural Center. At this world-class attraction, all galleries and facilities are wheelchair-accessible. Although some parts of the Chikasha Inchokka’ Traditional Village may require walking long distances, the center offers complimentary wheelchairs to all guests, as well as a golf cart service to take mobility-impaired patrons anywhere on campus. Call prior to visiting, and the golf cart can even meet your party in the parking lot. If you have a little assistance or a motorized wheelchair, hit the trails at the Chickasaw National Recreation Area. The 1.2 mile main trail to Antelope and Buffalo Springs is wheelchair accessible and runs from the nature center. Along the way, you’ll see forested areas, limestone hills and abundant wildlife. Located in Norman’s historic district, the Montford Inn offers hospitality and amenities that will give you a comforting and relaxing stay. Book a night in the Homesteaders Room and take your choice of one king bed or two twin beds. This room meets ADA requirements and has wheelchair accessibility. Guests will enjoy a private bathroom, inviting fireplace and hearty breakfast each morning. Enjoy a room with a view at the Pollard Bed & Breakfast in Guthrie. This 1902 Victorian-style inn is filled with antiques and historic charm. The main building was originally the Guthrie Savings Bank, and guests can still see the original vault and evening drop box. It also comes equipped with an elevator, making all but four rooms and the parlor wheelchair-accessible. While you’re there, head next door to the Pollard Theatre to catch a show. The theater offers three wheelchair spaces and two seats for wheelchair-bound companions. The Pollard produces six or more plays and musicals annually including the must-see “A Territorial Christmas Carol” each holiday season. Learn about downtown Oklahoma City’s renovation from a warehouse and distribution district to the thriving epicenter that it is today with a ride on the Bricktown Water Taxi. This 40-minute tour takes you past shops, restaurants, public art and historic buildings with a knowledgeable tour guide that will tell you interesting facts along the way. Each boat has a portable ramp and two wheelchair locations with tie-down straps. In addition, the one-mile canal is accessible via elevators and ramps. All aboard the Amtrak Heartland Flyer! This passenger train makes a morning trip from Oklahoma City to Fort Worth, Texas, with stops in Norman, Purcell, Pauls Valley, Ardmore and Gainesville. Then, it heads back into OKC in the evening. The lower level of the two Superliner Coaches features 12 wheelchair accessible seats on one end and restrooms on the other end. Although all seven guest rooms at Greta’s Inn B&B are located on the second floor, don’t let that stop you from booking a stay in this stunning 1929-era property. An electric chair lift is available to take you from the main floor, which still maintains its original wood flooring, to the second story. There are five guest rooms and two suites, all of which come with queen-sized beds and private baths. The suites also have an additional twin bed to accommodate larger parties or guests who desire separate sleeping arrangements. Experience the unexpected beauty found in Lone Wolf at the Quartz Mountain Resort. Nestled alongside a clear blue lake and tucked away amid rolling hills, this resort has several wheelchair accessible lodging options. In addition to the stunning lodge, on-site restaurant and bunkhouse, there are also two wheelchair accessible cabins available. Book a stay in either cabin 3 or 8, both of which come with a full-sized bed in the bedroom, a queen-sized sleeper sofa in the living area and a handicap accessible bathroom. Guests will also find a 576 sq ft ADA-compliant cabin at Kodiak Pines Cabins that is just half a mile from Fort Cobb Lake. In addition, there are modern cabins available at the Lake Elmer Thomas Recreation Area in Fort Sill. One of the medium cabins, which sleeps six, is also ADA-compliant. Located just over an hour northwest of Oklahoma City, Roman Nose State Park in Watonga offers overnight accommodations in both the lodge and one special cabin. Within the lodge, there are two rooms with king-sized beds, roll-in showers and a lowered countertop and sink. If you’re looking for a cabin stay, request the Roman Nose Cabin, which is a fully accessible cabin near the lake that comes with a full kitchen including lowered countertops and cabinets. In addition, there is a roll-in shower, one double bed and a one-person hospital bed. Pamper yourself with a stay at the Chaparral Guest House in Watonga. This private getaway located on 15 wooded acres just one mile from Roman Nose State Park offers one handicap-accessible room. Book a stay at the New Mexico Room to enjoy a queen-sized bed, bathroom with Jacuzzi tub and separate walk-in shower and a covered patio complete with a southwestern theme. Travel to the westernmost town in the Oklahoma panhandle for an unforgettable stay at the Black Mesa Bed & Breakfast. The Sunrise Cabin is handicap accessible and includes a queen-sized bed, double futon, refrigerator, microwave, Keurig coffee maker, full bath and shower, heat and air and a covered porch. Cool off during a hot summer day with a dip in the swimming pool at Boiling Springs State Park in Woodward. The swimming pool comes equipped with a lift and the pool’s bathhouse has been renovated to meet ADA requirements. Boiling Springs State Park also offers four cabins, several RV sites and an interpretive area behind the park office that are accessible. The shallow, salty water at Great Salt Plains Lake in Jet offers plentiful fishing opportunities for catfish, saugeye, sand bass and hybrid striper. Visitors will find an accessible fishing dock in the approach channel, one fishing area below the dam and areas on both the north and south sides of the spillway where they can wet a line. Looking for more ADA and Accessibility information for Oklahoma’s state parks? This comprehensive form offers in-depth details on lodging, campsites, trails, fishing docks and more.